Going into the 12 Manicures of Christmas, I wanted to do a Holiday Seriotype, I just wasn't quite sure if it would work or how. Because green and red are opposite on the color wheel and tend to make brown when mixed together, I was a little worried. But all those worries flew out the window as I watched this gorgeous Seriotype layering come together! 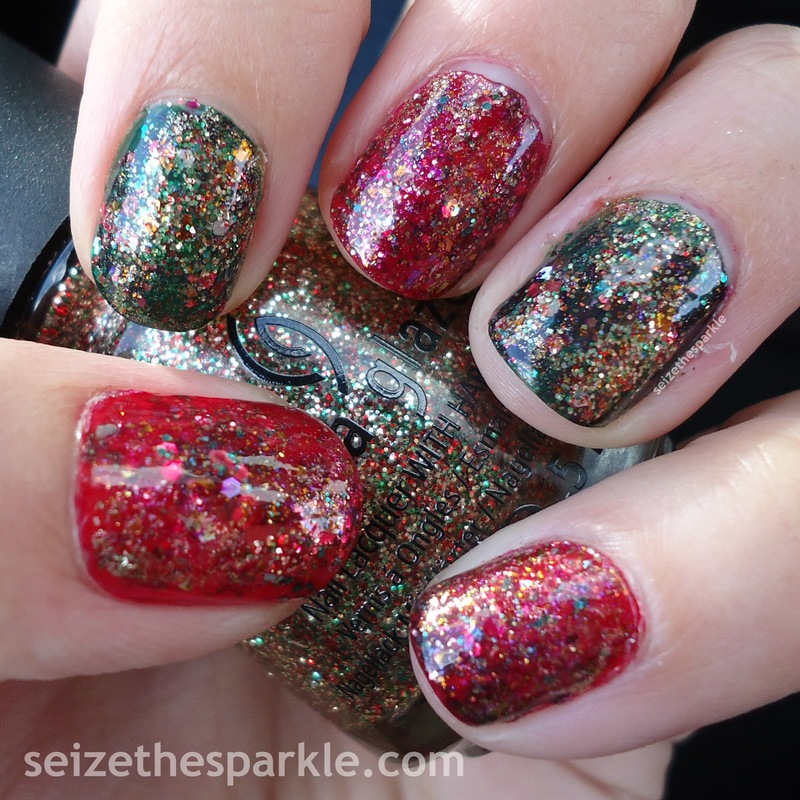 I started out by alternating Holly-Day and Pointsettia on my nails. 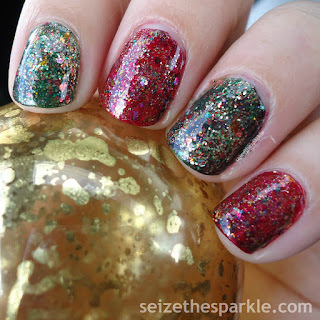 Using saran wrap, I randomnly dabbed Ravishing Dahling and Glittering Garland onto each nail. 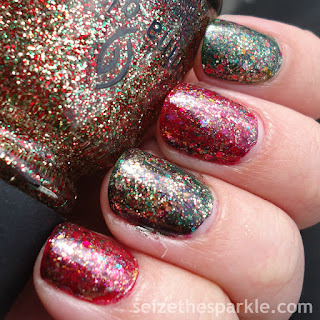 Then, I sponged on SinfulColors Holiday Rebel. Next, using my saran wrap again, I dabbed on a little bit of Mingle with Kringle. Twinkle Lights was sponged on top of that. After that, each red nail got a smidge more Pointsettia blotted with saran wrap. 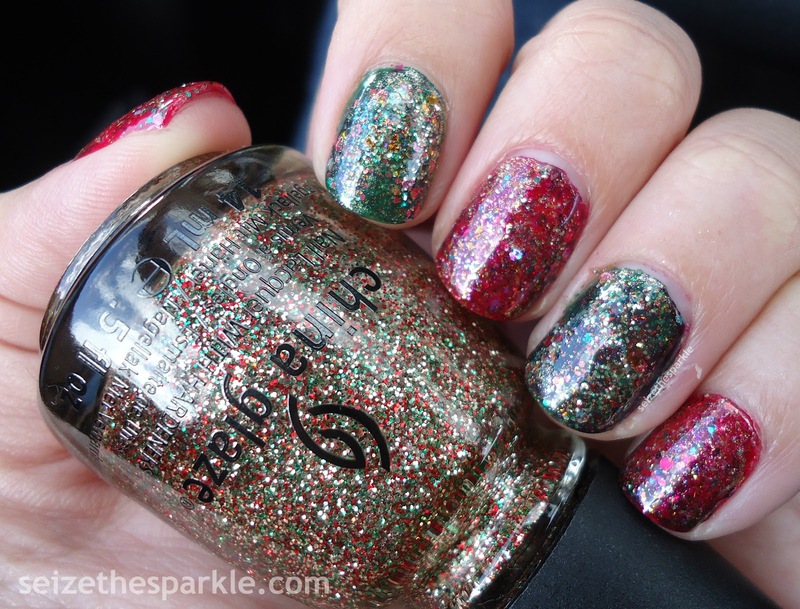 I did the exact same thing on my green nails, using Holly-Day. To finish off the Seriotype, each nail got a coat of Pahlish Autumn People. I added 2 coats of SinfulColors clear coat for extra smoothness, followed by a thick coat of Seche Vite. Talk about festive! I really love how this Seriotype turned out, and I'm honestly kind of sad that I have to take it off tonight. But I've still got a few more Manicures of Christmas to go! And speaking of those manicures, my December Rainbow Honey Mystery Bag came on Wednesday with two new gorgeous polishes in it. 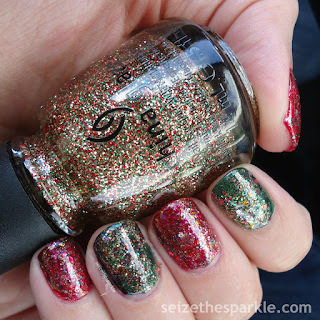 Today, my Black Friday Pahlish order arrived. Gumdrop Rooftop needs to be on my nails soon! And tomorrow, my Secret Santa goodies are scheduled to arrive, and the goodies I sent are scheduled to be delivered! Other than that, there's a little more Christmas shopping than I would like to have left at this point, but I think that's pretty common at this point! Peanut and I are baking cookies with Granny Sparkle, then she has a Christmas party to go to while I do a little more shopping or wrapping. I haven't decided yet. Either way... I'm still having a hard time believing that Christmas is only one week away! Eeeeeek!!! Where did December go?! ?